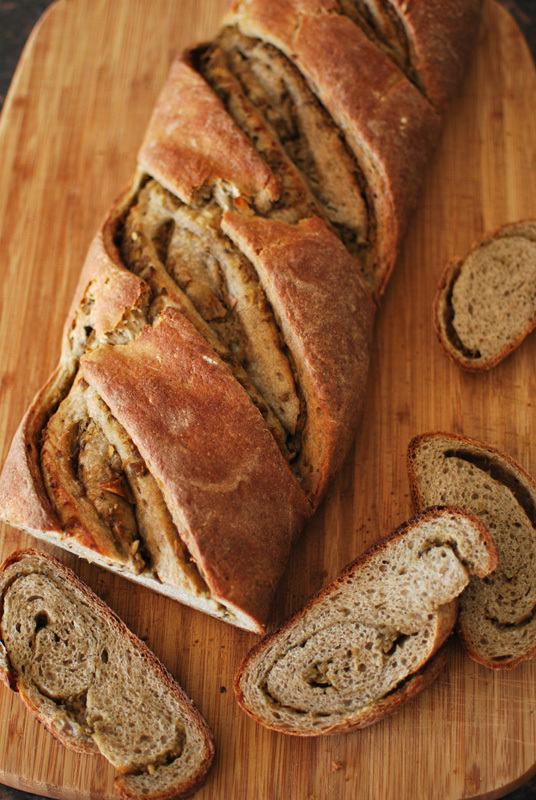 When I decided to make eggplant bread, I knew I wanted something earthy. See, I decided the best way to incorporate eggplant into bread was to roast it, turning it into a soft and caramelized sort of tapenade, then roll that into the dough. Eggplant can often be bitter if sautéed or steamed, but roasting never seems to have that effect. Roasting a meaty eggplant produces, as it does in many vegetables, rich, deep, earthy flavors. So in order to properly complement the fullness of the eggplant, I needed a bread robust enough to stand up to it, without taking center stage. Thinking it a bit boring to simply use whole wheat flour, I decided buckwheat flour would be a nice complement to the eggplant. Buckwheat, while not technically a true grain, has a very characteristic flavor, one that is grainy and earthy and grassy all at the same time. Never having had the two together, I nevertheless thought that it would be a delightful match for the eggplant. Looking around for ways to incorporate buckwheat flour intelligently – as it’s not a true flour, one can’t merely substitute it for bread flour – I came across a recipe from the esteemed Rose Levy Berenbaum, entitled Velvet Buckwheat Bread. It of course had the requisite buckwheat flavor, but it was called “Velvet”, for cripes sake, which to me meant that it wouldn’t have too hard a crust or too airy a crumb for the squishy eggplant filling. And from Ms. Berenbaum herself, to boot! It sounded perfect! After a few middling adjustments, I had my bread. As for the eggplant filling, I kept the extraneous ingredients to a minimum, to emphasize the essence of the eggplant, using only eggplant, onion, garlic, and a sprinkling of Herbes de Provence. Taking a cue from the incredibly good pomodori al forno used in yesterday’s bread, I roasted the eggplant at a low temperature with a generous amount of olive oil (not in the least because it soaked it up like a sponge). The roasted eggplant and onions were good enough to eat on their own, but became far, far better when all the flavors were melded with a quick spin in the food processor. The resultant tapenade was absolutely delicious, and I did re-appropriate a significant amount of it for a simple dinner, making sure there would be enough for its intended use. The buckwheat dough was supple and gorgeous to work with (though I’d expect nothing less from Ms. Berenbaum), and its brownish French gray color seemed to match the color of the eggplant so impeccably that an interior decorator could have done no better. It rose nicely, and smelled amazing while baking in the oven. Fresh from the oven, the finished loaf tantalized. It was pretty as the proverbial picture, the deep slashes revealing the layers of eggplant and bread, and it exuded that fabulous aroma. After it had fully cooled, which took just forever, the slices displayed an attractive spiral of tapenade, and were, truly, velvety. The crust was soft, but supported the interior well, despite the tendency of the slices to un-spiral a bit, especially after biting into. The combination of eggplant and buckwheat proved to be a great success, each flavor a lovely complement to the other, each holding up its own end of the flavor bargain, while not outshining. It was soft, it was full-flavored, it was robust, eggplant-y, and buckwheat-y; but most of all, it was just what I’d been imagining: it was earthy. 1. To make the dough, whisk together 6 1/2 ounces (1 1/4 cups) of the bread flour and the yeast, in the bowl of a stand mixer. Add the starter, water, yogurt, and honey. Whisk until smooth. 2. Top this sponge with the buckwheat flour and the remaining bread flour, forming a cover of flour over the sponge. Cover with plastic wrap and let stand at room temperature for 1 hour. After 1 hour, either let stand an additional 2 to 3 hours, or refrigerate for 8 to 24 hours. Let come to room temperature for 1 hour before proceeding. 3. To make the eggplant filling, preheat the oven to 350° F. Peel the eggplant, and cut into 1/2 inch cubes. Place in a large roasting dish or on a rimmed baking sheet. Chop the onion, and combine with the eggplant. Add the garlic, Herbes de Provence, salt, and pepper. Drizzle with enough olive oil to coat, and toss together. Bake for 45 to 60 minutes, stirring occasionally, until lightly browned and soft. Remove from the oven and cool slightly. 4. Using a food processor, pulse the roasted eggplant mixture a few times until blended, but still a bit chunky. Adjust seasoning as needed with additional salt and pepper. Set aside. 5. After the dough has rested, place the bowl on the mixer. Using the dough hook, mix at low speed until all the flour is incorporated, and a rough dough forms, about 2 minutes. Stop the mixer, and without removing the bowl or the hook, cover the bowl with plastic wrap and let rest for 20 minutes. 6. After 20 minutes, remove the plastic wrap. Add the salt, and knead at low speed until incorporated, about 1 minute. Increase the speed to medium-low, and knead for an additional 5 to 6 minutes, or until the dough is smooth and supple. 7. Transfer the dough to a lightly oiled bowl, cover tightly with plastic wrap, and let stand at room temperature for 1 hour. 8. Uncover the dough and, using a nonstick spatula, fold the dough over itself in a tri-fold, as though you were folding a letter. Cover again, and let rise an additional 45 to 60 minutes. 9. Lightly oil a large baking sheet, or line with parchment paper. Turn the dough out onto a lightly floured surface. Using a rolling pin to roll and using your hands to lift and stretch when necessary, shape the dough into a rectangle measuring 15 x 10 inches. If the dough begins to resist, cover and let rest for 5 minutes before trying again. 10. Spread the eggplant filling over the dough gently and evenly, leaving about a 1/2 inch border on all sides. Fold the dough edge on the short sides over the filling, stretching the dough and pressing down into the filling, so that the edge of the rectangle has an even thickness. Starting with a long edge of the rectangle, roll the dough up jelly-roll-style, into a tight spiral, keeping the short edges lined up evenly. When you get to the end, pinch the seam firmly to seal it well, to prevent the filling from leaking out during baking. 11. Dust the work surface lightly with flour, and roll the baguette under your palms to make sure the thickness is even, and to elongate slightly. Transfer the baguette to the prepared baking sheet, laying it diagonally if necessary. 12. Cover with lightly oiled plastic wrap, or a damp towel, and let rise until 1 1/2 times bigger in volume, about 1 hour. Thirty minutes before baking, preheat the oven to 450º F, and place another baking sheet or oven-safe pan in the bottom of the oven. If you have a baking stone, heat it with the oven. If not, your baking sheet is fine. 13. Using a sharp serrated knife or clean razor blade, make 3 or 4 decisive slashes in the top of the loaf at a 45º angle, evenly spaced. Spray or sprinkle the bread with water, and transfer the bread to the oven (or baking stone, if using). Immediately throw 4 or 5 ice cubes into the hot pan on the oven floor. Bake for 5 minutes, adding additional ice cubes as they melt. 14. After 5 minutes, remove the ice-cube-pan from the oven, and bake the baguette for an additional 25 minutes, or until deeply golden brown and fully cooked. Be sure not to under-bake the bread, as the filling needs to be fully heated through. Remove the bread to a wire rack to cool for a minimum of 1 hour before slicing, to allow the steam from the filling to dissipate. If sliced too early, the filling will not have set, and the bread will end up gummy and the attractive spiral pattern ruined. 1. Herbes de Provence is a blend of thyme, basil, rosemary, savory, sage, marjoram, fennel seed, and often lavender. If you don’t have any on hand, just use your favorite herb, or a mixture of similar herbs. 2. Instead of yogurt, you can use sour cream instead.